This diagram describes general architecture of Mobile Cloud Computing. AAA: Network Authentication, Authorization, and Accounting. 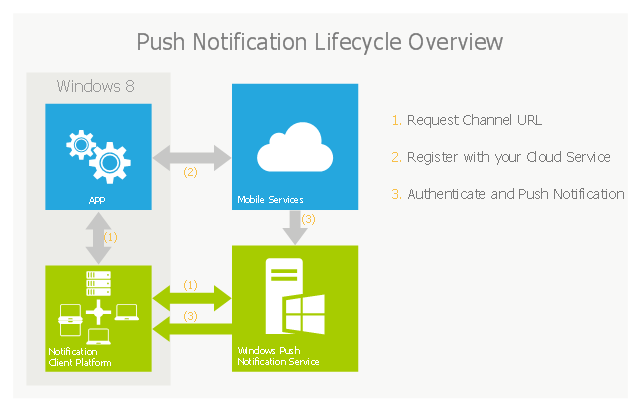 This example of cloud computing system architecture diagram was created on the base of picture in the post "Sending Windows 8 Push Notifications using Windows Azure Mobile Services" from the Nick Harris .NET blog. The Windows Push Notification Services (WNS) enables you to send toast, tile, badge and raw notifications from the cloud to your Windows Store applications even when your app is not running. Push notifications are ideal for scenarios when you need to target a specific user with personalized content. 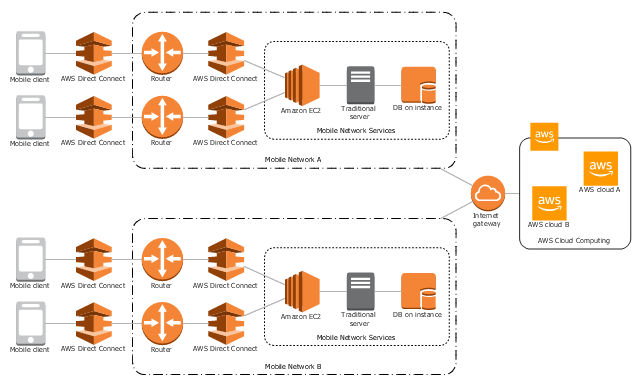 The vector stencils library "AWS Mobile Services and Game Development" contains 7 icons: AWS Cognito icon, AWS Mobile Analytics icon, Amazon SNS icons, AWS Device Farm icon, AWS Mobile Hub icon, Amazon GameLift icon.